Here's the inside story about the six 2014 Sustainable Princeton Leadership Award Winners, just in case you are interested in why your neighbors and friends were honored! late for his customers. This 30 year old company is one of those old fashioned family run operations where two or three generations work together and the staff become part of the family. It is a true local landmark. But there is more. Princeton Printer has embraced renewable energy and waste reduction practices from rooftop solar to soy ink. They also recycle all the metal, for 12 cents a pound, when the equipment is worn out. Princeton Printer’s sustainable practices set a high bar for other businesses in town. It is for the Princeton Printer family's active dedication to sustainable business practices and also for many year’s of loyal service to the Princeton community that they were awarded a 2014 Leadership Award. Penny Thomas accepting award for herself and Susie Wilson with Sustainable Princeton Vice-Chair , Heidi Fichtenbaum and Mayor Liz Lempert. Photo by Cyndi Shattuck. environment OR Princeton’s curbside organic compost program! These two individuals embody the persistence and tenacity necessary to change habits that will improve our world. For years, they have gone the extra mile to educate their neighborhood about the benefits of the curbside organics program. And, as a result, Constitution Hill residents are now rolling green bins filled with organic waste to the curb every Wednesday morning. And, if for some reason, a neighbor forgets, you can bet Susie or Penny will be roll their bins out for them! These two have worked with their neighbors, the property owner’s association and Princeton’s recycling coordinator to change their hearts and minds and successfully implement the program in their neighborhood. It is for this tireless dedication to the success of Princeton’s Curbside Organics Program and conviction that it is ALWAYS better to create healthy soil by composting than to send food waste to a landfill, that Penny and Susie were awarded a 2014 Sustainable Princeton Leadership Award. 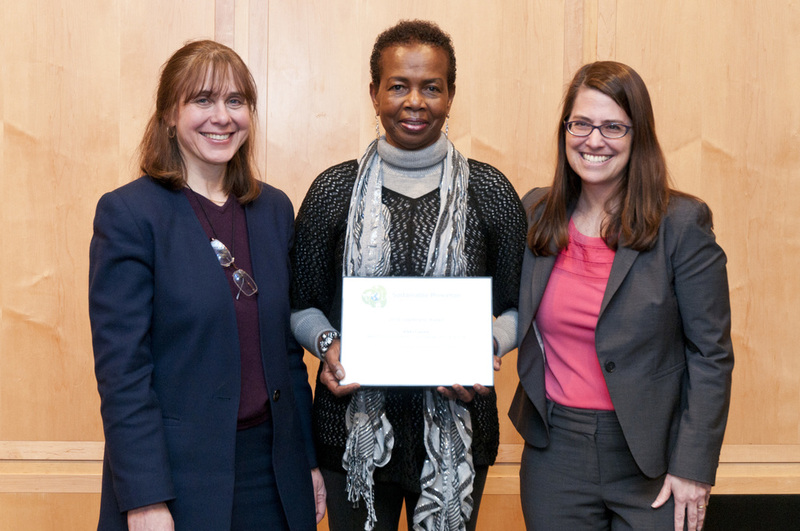 Vikki Caines accepting award with Sustainable Princeton Vice-Chair, Heidi Fichtenbaum and Mayor Liz Lempert. Photo by Cyndi Shattuck. go the extra mile for our town. Vikki Caines, has worked for the Princeton Recreation Department for 17 years. Outside of her 9:00 to 5:00 job, is a volunteer who has turned weedy patches of dirt around the Recreation Complex and turned them into colorful, healthy gardens. Whether large or small, these gardens bring a smile to people’s faces, serve as educational opportunities for young people and beautify a public space. It is for your belief that it is possible to create beauty anywhere if you have a shovel, a vision and the courage to do something no one else would have thought to do that Vikki Caines was awarded a 2014 Sustainable Princeton Leadership Award. Huck Fairman (center) accepting award with Sustainable Princeton Vice-Chair, Heidi Fichtenbaum (left) and Mayor Liz Lempert (right). Photo by Cyndi Shattuck. articles and books that connect people with his passion for the environment. He introduces people to one another to create positive change for our community. His Solutions Columns in the Princeton Packet are eloquent, informative and provided to the paper free of charge. It is this kind of dedication to education about the environment that works well in a town that appreciates a well researched story. His column gives a voice to solutions addressing environmental problems which is a critical aspect of the work we are doing. It is for the excellent work to expose the community to the importance of environmental stewardship through the written word, that Mr. Fairman was awarded with a 2014 Sustainable Princeton Leadership Award. 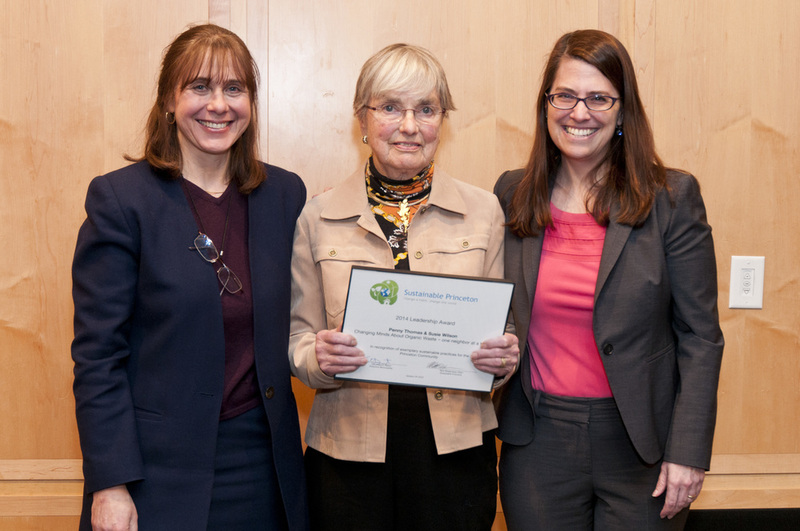 Alexandra Bar-Cohen (center) accepting award with Sustainable Princeton Vice-Chair, Heidi Fichtenbaum (left) and Mayor Liz Lempert (right). Photo by Cyndi Shattuck. all the time in the name of sustainability and zero waste. She is the ultimate citizen activist: tireless, educated, persistent and a resource for anyone, anytime. You might find her at the Littlebrook Elementary School Spring Picnic educating students and parents about the importance of composting and the evils of single use plastic bags with a warm smile and positive attitude. After the picnic, its true that you might find her transferring a plastic bottle or a half eaten apple from the trash can to the compost bin. At the Jewish Center in Princeton, Alexandra helped start the Sustainability Initiative with a focus on zero waste events and composting. Her goal is for everything on the table at all their events to be compostable and ultimately break down into healthy soil. She has worked long and hard behind the scenes to bring a zero waste mentality and operationalize composting at the Jewish Center. Its not easy being a one woman zero waste champion, but Alexandra Bar Cohen makes it look like it is. It is for her persistence andnitty gritty — get you hands dirty approach to ensure zero waste events become a reality in our community that Ms. Bar-Cohen was awarded with a 2014 Sustainable Princeton Leadership Award. Zach "Woogie" Woogen (center) accepting award on behalf of himself, Kate Yazujian and Tag Quijano (not pictured) with Sustainable Princeton Vice-Chair, Heidi Fichtenbaum (left) and Mayor Liz Lempert (right). Photo by Cyndi Shattuck. School Environmental Action Club Leaders and were honored for their ongoing and dedication to environmental education and engagement. As student activists they have conducted a green house gas assessment, a trash audit, hosted Harvest dinners on sustainable agriculture and attended conferences with other young environmental leaders. Their collective efforts have engaged and informed so many about the importance of sustainability now and in the future. They humble, inspire and give hope that there is a new group of leaders to help with the work ahead. Hope to see you at the awards next year! Sustainable Princeton's 2014 Leadership Awards Winners Announced! Sustainable Princeton and the Princeton Environmental Commission (PEC) are delighted to announce the winners of the 2014 Sustainable Princeton Leadership Awards! This year ’s awards will be presented to a municipal employee, three high school students, a local business and three residents. The awardees were chosen based on the impact of their work, how innovative it was and if they were an unsung hero working quietly to create positive change. Activities of the awardees include everything from planting special municipal gardens to hosting zero waste school picnics and conducting a Greenhouse Gas Assessment at a local school. A review committee comprised of community members selected the six winners. Awards will be presented on Thursday, January 29th from 7:00 to 9:00 p.m., in the Community Room at the Princeton Public Library. The award ceremony is free and open to the public. Alexandra Bar-Cohen, Resident – for her volunteer work to create zero waste events and a zero waste culture at the Jewish Center and Littlebrook Elementary School, and her advocacy on behalf of the county-wide plastic bag referendum. Alexandra has been responsible for changing the daily habits of countless numbers of Princeton residents and, in so doing, has helped steer us all toward a more sustainable future. Vikki Caines, Princeton Recreation Department - for her dedication and success beyond her 9:00 to 5:00 job to envision, plant and tend special gardens at the Municipal Complex at 400 Witherspoon Street. Whether large or small, these gardens bring a smile to people’s faces, serve as educational opportunities for young people and have beautified forgotten patches of dirt and turned them into thriving gardens. Hutchinson “Huck” Fairman, Resident - for his consistent, persistent and successful efforts to inform our community about environmental issues. Huck’s Solutions Column, which appear regularly in the Princeton Packet are eloquent and convey his passion for all things sustainable. He does not receive any money for his work. In addition, his networking and connections around sustainable behavior have inspired important environmental action in Princeton. Tag Quijano, Zach “Woogie” Woogen & Kate Yazujian, Students – for their collective efforts to advance sustainability at the Princeton Day School such as organizing an annual Harvest Dinner for 250 and the PDS Student Environmental Conference. They were part of a Greenhouse Gas Assessment team and are leaders at the national Student Climate and Conservation Congress run by the Green School's Alliance. Princeton Printer, Local Business – for demonstrating leadership and guidance in greening the infrastructure and operations of a local downtown business. They are a model and a knowledge-resource for everyone about how to run a green business, from installing solar panels on their rooftop to using soy ink and recycling worn out printers. Penny Thomas & Susie Wilson, Residents – for their tenacity in working through obstacles to implement the town’s curbside organic waste program, Princeton Composts, at Constitution Hill. They worked with their neighbors, their property owner’s association and Princeton’s recycling coordinator to successfully bring the program to their neighborhood. The Sustainable Princeton Leadership Awards are sponsored by Sustainable Princeton with support from the Princeton Environmental Commission. Each year, a call for nominations is issued to help us identify Princeton’s best, brightest and greenest businesses, residents, teachers, school administrators, students, municipal employees, faith leaders and any others that are leading the way toward a sustainable Princeton.